Pack of four Finger Puppet books. 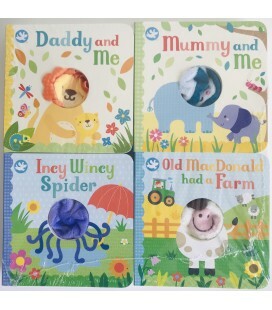 - Incy Wibcy Spider - Old MacDonald has a farm - Mummy and Me - Daddy and Me Wiggle the cute puppets and enjoy well-loved rhymes and stories with your baby or toddler. This hand puppet book takes you on an exciting read-and-play adventure on the farm! Are you afraid of the Gruffalo? NO! Have fun waving his claws, tickling his prickles and making fun shiver and shake when he meets the mouse. Boris just wants to be loved. The things is, he´s too...BIG and...KISSY and...TICKLY! But sometimes, being big and kissy and tickly is exactly what´s needed!